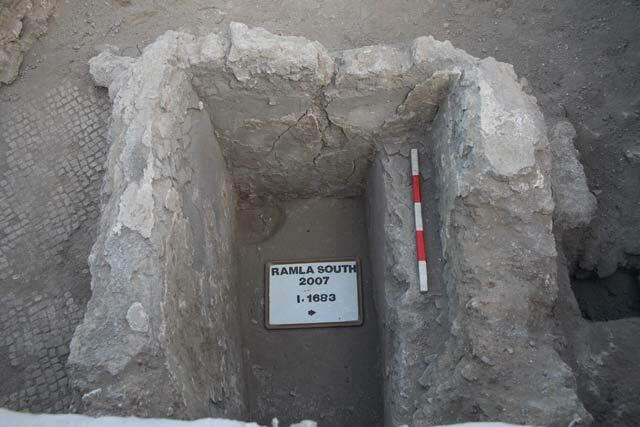 During July–August 2005, June–July 2006 and July 2007, excavations were conducted in the eastern part of the Ramla site (South; License Nos. B-298/2005, B-306/2006, Permit No. A-5168), in an area that was mostly used as a military base until several decades ago and an area where the access road to Moshav Mazliah was located. 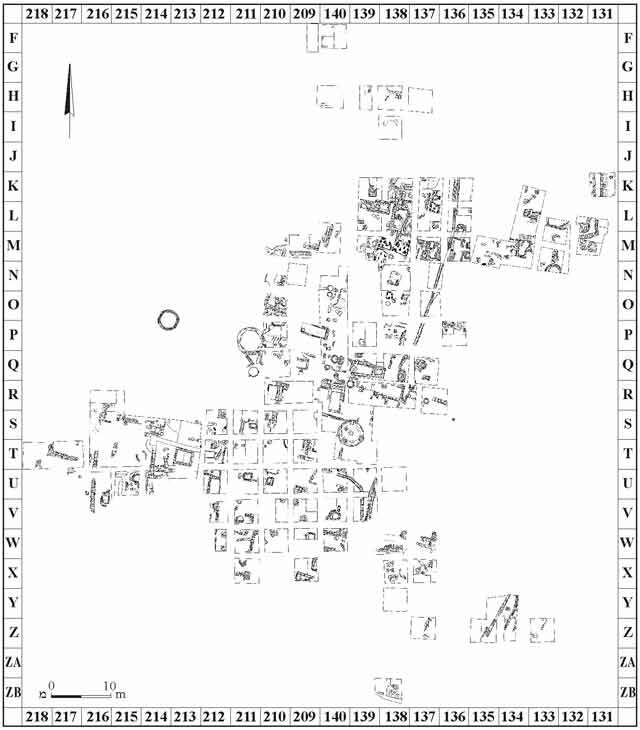 The excavations, undertaken on behalf of the Institute of Archaeology of the Tel Aviv University and the Israel Antiquities Authority and underwritten by the Israel National Roads Company, Ltd., were directed by O. Tal and I. Taxel, with the assistance of M. Edrey, M. Iserlis, I. Gordin, T. Harpak, G. Lerner, N. Messika, A. Nashef and A. Nativ (area supervision), A. Keinan (registration), N. Wachidi, E. Inbar and R. Eran (administration), D. Porotsky and V. Pirsky (surveying and drafting), P. Shrago (field and studio photography), A. Brauner (preparing plans for publication), N. Halperin (metallurgical laboratory), Y. Wiener and R. Pelta (pottery restoration) and N. Messika, R. Pinchas and A. Perry (drawing). The excavation results and finds were processed by O. Tal and I. Taxel, with the participation of R.E. Jackson-Tal (glass), A. Yasur-Landau, D. Sweeney and R. Shimelmitz (Middle Bronze Age finds) and N. Amitai-Preiss (numismatics). 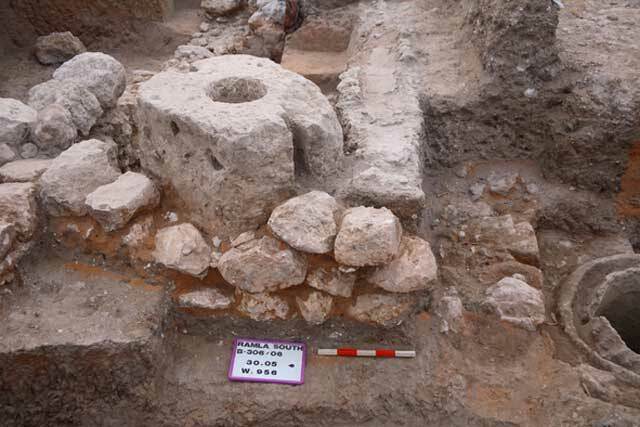 The final report was published in 2008 (O. Tal and I. Taxel, Ramla [South]: An Early Islamic Industrial Site and Remains of Previous Periods, Tel Aviv) and a summary of the findings is presented hereafter. The Ramla site is located south of the city of Ramla, along both sides of the access road to Moshav Mazliah; one hundred and fifty squares were excavated. The surface in some of the squares consisted of gravel beds, kurkar, asphalt and the like, which was the result of development activities at the site over the recent generations that greatly ravaged the archaeological remains. Nonetheless, the geological characteristics of the site aided, at times, in determining the stratigraphy. Ramla (South) is situated on gromosol; hamra soil was discovered at different depths throughout the site, in and upon which the site’s strata were founded. Other layers were set on top of brown alluvium or red or yellow sand, which characterize the region, as alluded to by the city’s name, Ramla (ramal = sand). The ceramic artifacts from the site were dated to several periods: Middle Bronze IIA, the transition from Middle Bronze IIA to IIB, Late Bronze Age and the Persian, Hellenistic (Hasmonean), Roman, Byzantine, Early Islamic (all phases), Mamluk, Ottoman and the Mandatory era. Not all the periods were represented by architecture and in some instances, potsherds were the sole testimony to a period, for example, a complete jar and bowl attributed to the Late Bronze Age, which probably originated in a tomb that did not survive, or fragments of tableware, cooking and storage vessels from the Persian and Early Roman periods that were recovered from squares in the western part of the site. Strata 1–6 (below) represented chronological phases that were not necessarily stratigraphic. A stratigraphic section, in which the potsherds represented all the periods at the site, could not be traced. On several occasions, the ceramic assemblages from early periods were discovered in a level higher than the assemblages and/or architectural remains of later periods, due to numerous disturbances that occurred at the site over time. 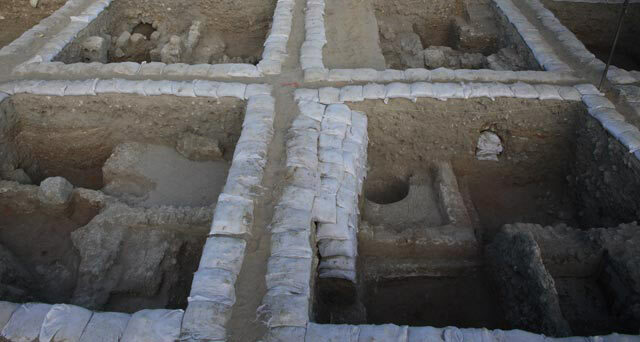 It should be mentioned that many robber trenches, which had impaired the preservation of archaeological remains or hampered the understanding of stratigraphy, were exposed in all the excavations of Ramla (South). The trenches were intended for robbing building stones and construction material in a region where stone was in short supply. The stratum was discovered in Squares S213, S214 and T214 (Fig. 1). 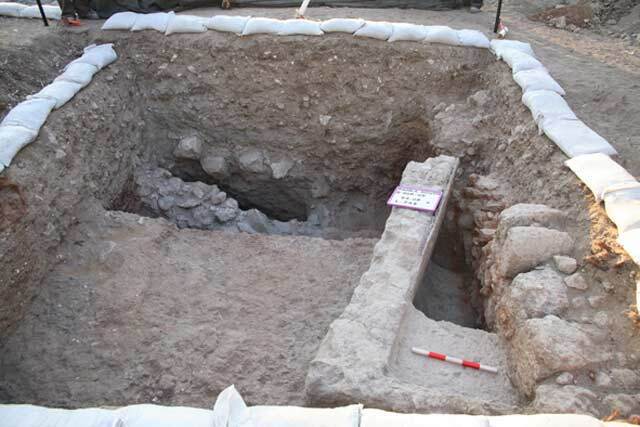 A series of installations and pits that dated to the Early Islamic period (eighth–ninth centuries CE) sealed it and were partly founded on the MB layer or penetrated it. It is noteworthy that a few MB potsherds, not in context, were discovered in the adjacent squares, yet an excavation down to virgin soil did not reveal any remains from this period. This stratum was represented by eight habitation levels of brown clayey soil that were probably the result of disintegrated mud bricks. The stratum had no architectural remains, but was rich in potsherds that were laying one atop the other, separated by a grayish yellow sand layer (average thickness of each layer c. 0.2 m). The potsherds consisted of an assortment of bowl fragments, handmade and wheel-thrown cooking pots, kraters, jars and jugs. A distinct find was a jar handle stamped with a scarab of an ancient Canaanite type (the altar pattern), which was discovered in an Early Islamic pit that had cut the MB IIA habitation levels. 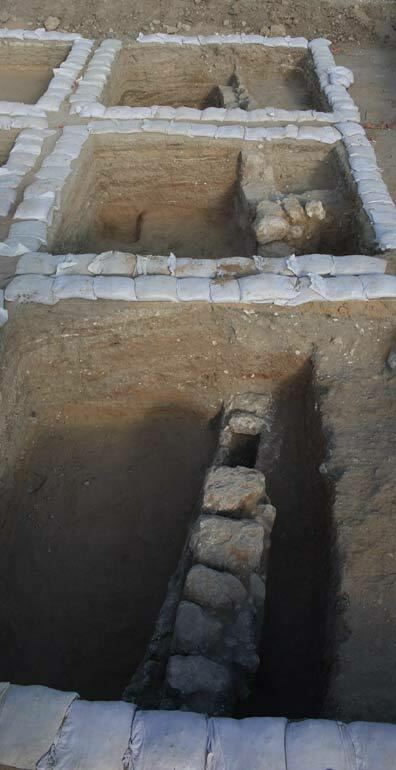 Judging by the nature of the remains, it seems that this was a courtyard of a building that did not survive or a temporary encampment site that was re-inhabited for short periods during the MB IIA. This “stratum” consisted of hamra soil pockets in several places at the site that contained pottery (including a perforated cooking pot) and glass vessels and a few Hasmonean coins. It seems that the remains of the Early Islamic stratum eradicated any trace of the architectural remains from this period. However, a section of a rectangular plastered pool (1.2 × 3.0 m) that had two steps leading down to its bottom was exposed in Square X209 (see Figs. 1, 4). The southeastern corner of a stepped foundation was exposed in Squares M140/209 (see Fig. 1). Its exterior faces were built of ashlar stones, with a core of fieldstones and soil and it was preserved five courses high (1.4 m). 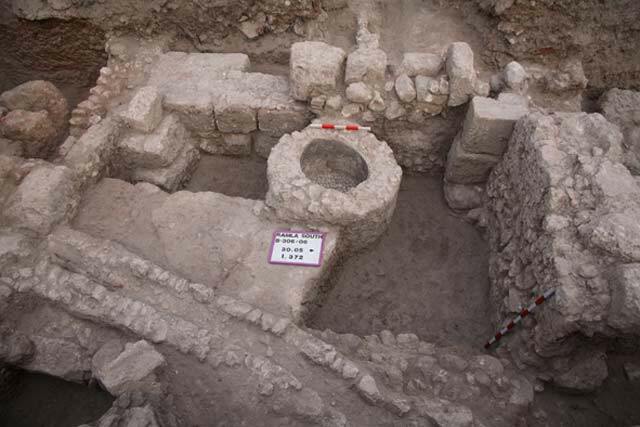 Several fragments of cooking pots and jars from the Late Roman/Early Byzantine period were discovered in the fill of the foundation, which was probably that of a massive public, cultic or military building that did not survive. Architectural remains that dated to the sixth–seventh centuries CE were revealed in various scattered squares. The date of the remains was based on the ceramics, glass and coins they contained. Ashlar Building. 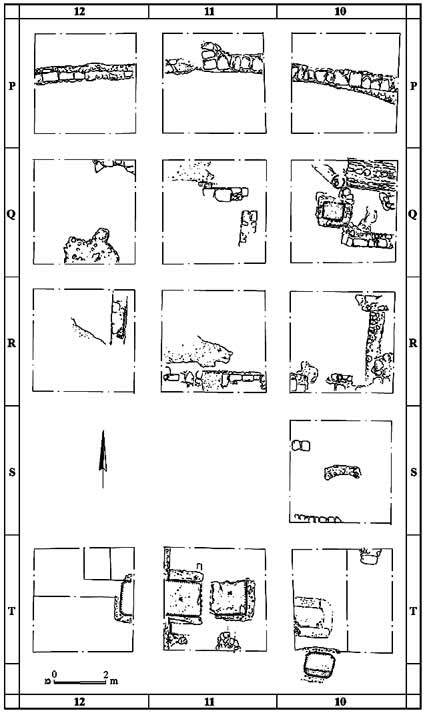 Building remains were uncovered in Squares K/L138 and L139 (see Fig. 1). The interior face of the walls was built of small fieldstones bonded with mortar, without plaster and the exterior face was constructed from ashlar stones, some of which were meticulously dressed and some were only roughly hewn. It seems that the ancient masonry stones used in the building were probably dismantled from a structure in Stratum 3 (above). The main section of the building was a rectangular room (2.0 × 3.2 m; Fig. 5), whose southern and eastern walls were preserved to the height of the foundation course, while its northern and western walls survived three courses high; no remains of an opening were discovered. It can be assumed that the entrance to the room was set in the southern or eastern walls. Pillars intended to support an arch were built in the room’s northwestern and southwestern corners. The room had a plaster floor that abutted the second course of the walls and only a small section of it had survived in the south of the room. A probe was excavated where the floor was missing, revealing the walls’ foundations that were set on virgin soil. Other walls that abutted those of the room were exposed north and east of the building. More walls and a section of a plaster floor, founded on flint and limestone pebbles, were discovered in two places west of the room. It is unclear whether the remains were part of the building or belonged to other buildings close by. The remains of the ashlar building were severely damaged by later construction and the robbing of stones, which were attributed to the Early Islamic period. An Installation and an Adjacent Tabun. Two parallel ashlar walls—in the east and in the west—were discovered east of the ashlar building; they survived to the height of the foundation course and had a coarse white mosaic floor between them. A square engaged pillar that may have been meant to support an arch was incorporated in the western wall and next to it was a round plastered pool, paved with a white mosaic, with a sump in its center. A small tabun, abutted by a plaster floor, was discovered slightly south of the mosaic floor. Olive Press Complex. Two cylindrical screw weights were exposed in Squares Q139/140 and R139/140 (see Fig. 1). Each of the weights had two narrow hewn grooves in their sides and two large stone collecting basins were located alongside them. One of the weights was discovered in situ (Fig. 6), while the other was found lying on the ground. The collecting basins were discovered in situ, embedded deep into the hamra soil. The original levels of the olive press, including the work surfaces, were not preserved. Winepresses. Floors paved with a coarse white mosaic, with collecting vats in their corners (Fig. 7 ), were discovered below the remains of the Early Islamic period in the northern part of the area, Square O138 and in the southern part of the area, Squares X10/11–Y10/11 (Fig. 3). A large stone, which was probably used as a base for anchoring a press screw, was found below the winepress, excavated in 2007. Another plastered stone basin, probably also for collecting liquid, was revealed in the northwestern corner. Sections of other surfaces paved with a coarse white mosaic were discovered to the south, east and west, beyond the area of the treading floor. These could have been used by other winepresses or other parts of the same winepress, which had been dismantled when the installations of the Early Islamic stratum were built. Pottery Kilns. Sections of kilns below the remains of the Early Islamic period that had been destroyed in the past were revealed in Squares S10 and T10 (Fig. 2), opened where the access road to Moshav Mazliah passed. A section built of fired mud bricks in a horseshoe shape and mud brick collapse whose outline was curved were preserved in one of the complete installations. A refuse pit, discovered nearby, primarily contained fragments of Palestinian bag-shaped jars, which are characteristic of the central and southern coastal plain. Some of the jars were deformed and it can reasonably be assumed that they had been fired in the kiln. Glass Furnace. 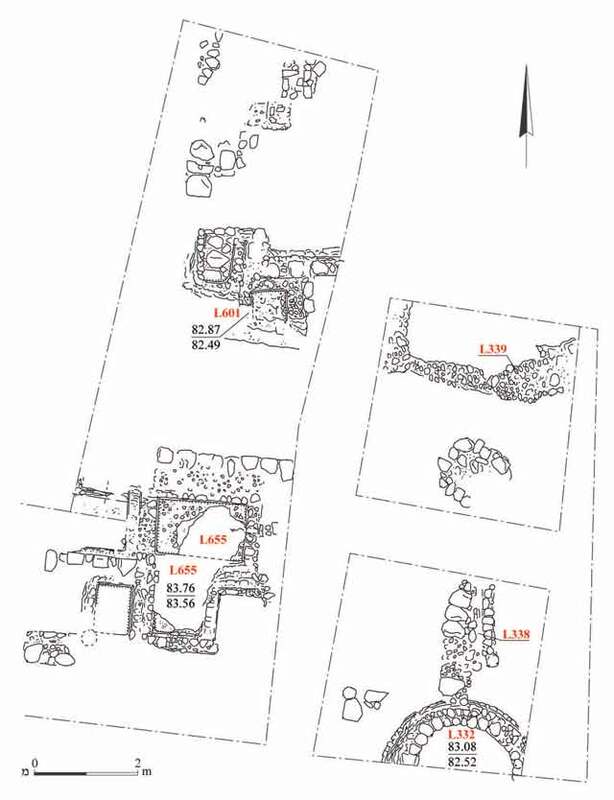 Small amounts of fired mud-brick collapse (of a kiln) were discovered in Square Y134 (see Fig. 1). Next to the collapse was debris from a workshop where glass had been blown. Fragments of glass vessels, deformed fragments and leftover glass fragments that bear marks of moil detachment were discovered alongside chunks of raw glass and of debris from worked glass. This stratum represents the main phase of the site’s occupation that began some time after the founding of Ramla at the beginning of the eighth century CE, probably around the middle of the same century, at the end of the Umayyad or beginning of the Abbasid periods. An extensive complex, clearly industrial in nature, was constructed at the site. It included numerous and assorted installations—cisterns, water pipes, channels and pools—that were intended for the storage, conveyance and use of water and perhaps other liquids as well. Installations that included vaulted septic pits and floors of plaster, stone and mosaic, meant to fulfill other functions in the industrial activity of the site, were built next to them. Almost all of these penetrated into the earlier strata remains and caused additional damage. The remains of this stratum, which consisted of several sub-phases, were discovered in all the excavation squares; in light of the extensive archaeological work that was conducted in the area it is clear that they extended beyond the limits of the excavated area. The dating of the installations was based on the ceramics, glass and coins they contained. Cisterns. Seven cylindrical-shaped cisterns (diam. 1–5 m) that had a domed ceiling were discovered. All were built of different size fieldstones, bonded with cement and coated on the inside with at least one layer of plaster. It was found in the examined cisterns that the upper layer of plaster on their sides was embedded with potsherds, mostly body fragments of jars that dated the construction of the cisterns. Most of the cisterns were found filled with alluvium almost to their ceilings and sometimes their upper sections had caved in. The largest of the cisterns in Squares S-T139/140 (see Fig. 1)was the only one discovered almost completely clean of silt (measured depth 11 m). A square opening (width c. 0.5 m), built of ashlar stones, was set at the top of its domed ceiling. Ceramic pipes that led to two sides of the cistern were probably meant to convey water to the installation and drain off its overflow; the openings of the pipes were located at different levels in the sides of the cistern, in which case the cistern was used for storage and distribution (Fig. 8). Pipes and Channels. The remains of many pipes and channels, used to convey water and possibly other liquids, were discovered. All the pipes and most of the channels were subterranean and only several channels were above ground and embedded in the floors. A source or terminus of a pipe/channel was found in many places, usually in cisterns or pools. Most of the pipe remains were composed of ceramic sections that had a limited number of standard diameters. The fragile pipes were lined on all sides with a protective layer of small fieldstones bonded with mortar. Relatively short sections of pipes were usually discovered; however, it was possible in one instance to trace the course of a pipe that crossed the excavation area from north to south, over a distance of c. 60 m. The source and terminus points of this pipe were not discovered and it is not clear what its purpose was. In any event, the path followed by the pipe seems to have served at least two pipes or another pipe and a channel that were set at lower levels. The upper long pipe was built in accordance with the topography of the site; it was necessary to lower its level in the northern part by installing a cement ‘elbow’. Unlike the pipes, the channels were built of roughly hewn stones and small fieldstones, bonded with cement. The inner faces of their sides were plastered, although plaster was not always applied to their floors. The channels were usually covered with roughly hewn stones; however, in several places no covering stones were discovered and the channels were probably open or all their covering stones were robbed (Fig. 9). The channels apparently did not lead to the cisterns, but rather to industrial pools and perhaps to septic pits. Pools. Remains of c. 40 pools in various states of preservation were discovered. Sometimes only the floors of the pools and the foundations of their walls were found and sometimes, entire pools were exposed to their full depth. They were built of small fieldstones bonded with cement and their sides, flat bottom and sometimes the tops of their walls, were plastered (Fig. 10). As was the case with the cisterns, body potsherds of jars were embedded in the upper layer of plaster in all the pools. Occasionally, a marble slab fragment was embedded as a foothold in the wall of the pool, meaning to aid in entering and exiting the pool. Three types were discerned among the pools: (1) Rectangular water reservoirs with a barrel vault ceiling. Four such pools of different sizes were exposed and most of their ceilings were collapsed when excavated; (2) Square, rectangular or rectilinear pools. About 30 pools were exposed; most were small and quite shallow (average dimensions 0.5 × 1.0 × 1.0 m) and only a few were larger and deeper. Most of the pools could not be directly related to other remains in their proximity due to the site’s state of preservation. A narrow step was installed next to the long side in some of the pools and in others, a sump was located in one of the corners (Fig. 11); and (3) Small round pools that were quite shallow (diam. c. 1 m, depth c. 0.5 m; see Fig. 1). Vaulted Septic Pits. Remains of thirteen underground vaults were discovered. Most of them were barrel-shaped (average dimensions 1.5 × 2.0 m) and noted among them was an especially large vault in Squares R/S140 (see Fig. 1). 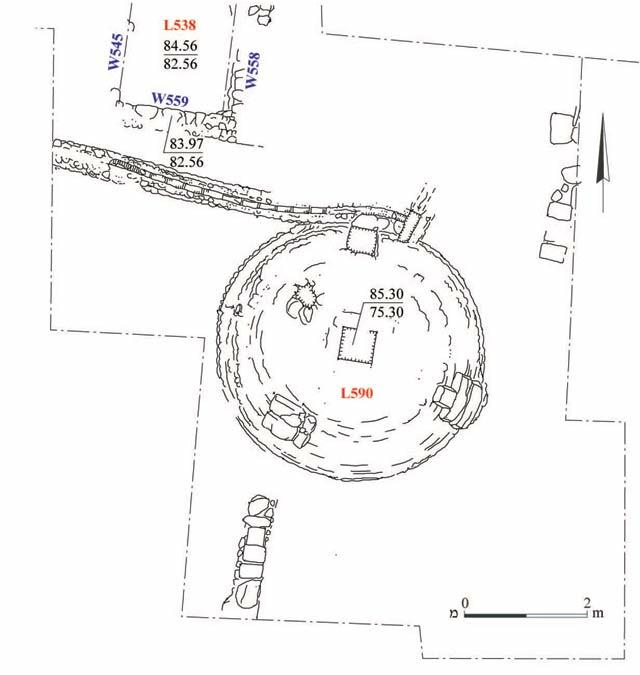 In the absence of access steps, floors or any other means that rendered them usable, as well as their proximity to the pools (above) and work surfaces (below), it is obvious to conclude that the vaults were initially used as septic pits for wastewater and/or run-off. Interestingly, many of the vaults were used as refuse pits in a later phase, or even simultaneously, when they still functioned as septic pits. They were found filled with large quantities of domestic debris, mostly pottery vessels, but also glass vessels, metallic objects, a few coins and animal bones. Hence, the richest assemblages of artifacts at the site were recovered from some of the vaults. A preliminary analysis of the finds showed that they should be ascribed to the ninth century CE and that some of the vessel types may have extended into the tenth century CE. The pottery and glass vessels represented the common domestic assemblage of the period. In the absence of deformed shapes, it appears that this was not workshop debris, but rather regular household garbage. Work Surfaces. Sections of paved surfaces that were adjacent or close to pools and vaulted septic pits were discovered in many of the squares. The surfaces were usually made of plaster and small stones and the repair layers upon them were indicative of several phases (Fig. 12). The work surfaces functioned in industrial activity and were not floors of dwellings. In addition to the plaster work surfaces, others of beach rock that was especially brought to the site from the Mediterranean coast and of coarse white mosaics were documented. Refuse Pits. 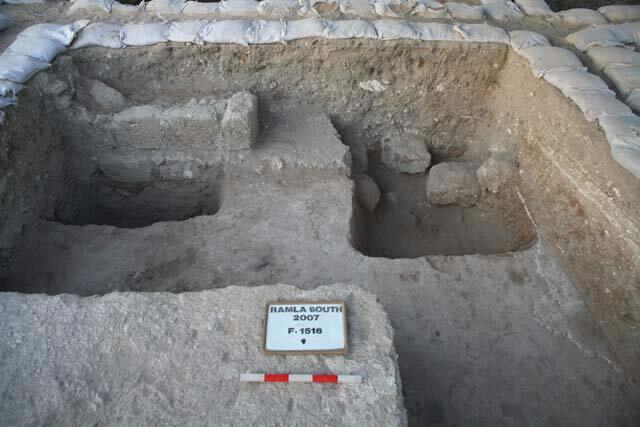 A section of a large deep refuse pit, dug into the natural hamra soil, was discovered in Square Y138 (see Fig. 1). A series of refuse pits and deposits were leveled and dug one into the other. The pits were probably located along the southern fringes of the site and contained a very large quantity of finds, mostly pottery vessels, along with glass vessels, stone objects and animal bones. The pottery vessels, like the artifacts from the underground vaults, were dated to the ninth and tenth centuries CE, although the upper levels of the pits also contained vessel types of the eleventh century CE. This stratum was represented by finds discovered on the surface, without any relation to architectural remains. The finds ascribed to the Mamluk period included a complete ceramic jug, whereas a few fragments of pottery and glass vessels, Marseille roof tiles and metallic objects, discovered in the north of the site, were attributed to the British Mandate era. It seems that the latter belonged to the British military base in the area and/or to the Arab settlement located nearby. The two earliest strata at the site, ascribed to Middle Bronze IIA and the Hasmonean period, were an innovation in the archaeology of the region; the MB IIA site was most likely connected to the network of roads that linked Ashqelon with Afeq, the prominent political centers in the south of the country during this period, as well as to other sites in the region, such as Tel Miqne, Gezer and Ashdod. The Hasmonean site was probably rural in nature and inhabited by Jews in the second half of the second century BCE, as part of the Hasmonean political strategy to create a ‘Jewish territorial sequence’ in the region of Modi’in and Lod, which would have separated the pagan coastal cities of the Shephelah (Philistia) from the Jewish settlement in Judah and its lowlands. This Jewish settlement probably continued to exist in the Early Roman period as well, based on the ‘Jewish artifacts’ (e.g., stone vessels and coins) recovered from ourexcavations, as well as from other excavations in the vicinity (HA-ESI 118 4144; Permit Nos. A-4454, A-5311, A-5331). The nature and function of the ashlar-built foundation is unclear and therefore, the character of the site in the third–fourth centuries CE remains unknown. During the sixth and seventh centuries CE, a small rural settlement existed at the site and included dwellings, industrial installations and workshop facilities—pottery kilns and glass furnaces, winepresses and olive presses—mostly built along the settlement’s margins. The settlement was administratively subordinate to Lod (Diosopolis/Georgiopolis), the largest city in the region. Its abandonment can be attributed to the founding of Ramla (c. 715 CE) and the gradual decline of Lod. Certain settlements in the rural hinterland of these two cities continued to exist after the sharp political and administrative changes in the region, while other settlements were abandoned in the wake of these changes. Historical sources from the Early Islamic period and the many excavations that had been carried out in Ramla indicate that the economy of this city was diverse. A variety of crafts was practiced, including processing of agricultural produce that was grown around and beyond it, textiles (manufacturing, weaving and dying) and the production of pottery, glass, stone and metallic items. Some of these crafts required the use of large quantities of water and the assemblage uncovered in the current excavations evidences this need unequivocally. It is feasible that most of the installations at the site were used in the various phases of processing the flax plant (Linum usitatissimum L.) to produce fibers that were intended for spinning. The contemporary historical sources mention that flax was grown in Ramla, in the alluvial fields south and east of the site, which benefited from a dependable water table c. 3 m below today’s surface. Growing flax was practiced in the region also in modern times, until the 1960s and was replaced with cotton, which is grown in this region to date. The lack of finds that can be attributed to spinning and weaving crafts negates the possibility that the fibers produced at the site underwent further treatment. Moreover, it seems that the absence of colors on the sides of the many discovered pools invalidates the possibility that the site was used for dying cloth. The establishment of the complex is dated to the end of the Umayyad period and particularly, to the Abbasid period. A relatively small amount of finds that definitely dated to the Fatimid period (the end of tenth–eleventh centuries CE) indicates that at least parts of the complex continued to exist in this period, possibly until the destruction of Ramla in the earthquake of 1033 or 1068 CE. Nevertheless, the vast majority of the finds indicates that the main activity at the site occurred until the tenth century CE. The geographer Ibn Thafar mentions in one of the historical sources that spinning mills for weaving linen were established in Egypt at the end of the tenth century CE; these perhaps caused the industry in Ramla to wane and perhaps, to be abandoned altogether until modern times. In any event, with the decline in the growth of flax and production of linen in the tenth century CE, as the excavation indicated, there was apparently an increase in the growth and production of cotton, which was considered a more profitable crop economically, taking a prominent place in the textile industry of Ramla and the Land of Israel. 2. 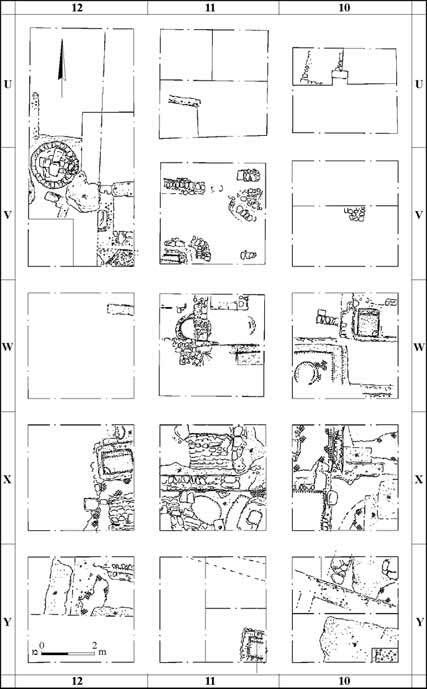 Season 2007, Squares P–T/10–12, plan. 3. Season 2007, Squares U–Y/10–12, plan. 4. The stepped pool from the early Byzantine period. 5. Ashlar building from the Late Byzantine period and remains from the Early Islamic period. 6. In situ remains of the olive press from the Late Byzantine period. 7. A winepress from the Late Byzantine period. 8. The large cistern from the Early Islamic period, plan. 9. A covered channel from the Early Islamic period. 10. A complex of pools from the Early Islamic period, plan. 11. A square, stepped pool from the Early Islamic period. 12. Plastered work surfaces from the Early Islamic period.